A series of mathematics enrichment titles developed by the NRICH team at Cambridge University. 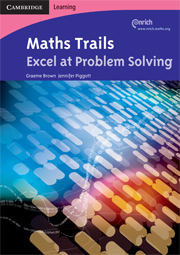 This Teacher's Guide details 17 problem solving activities arranged in a trail progressing in difficulty. Each activity focusses on a specific skill or strategy that develops a particular aspect of problem solving. Full supporting notes for teachers include useful questions, prompts and hints for students and possible outcomes for each activity.